What Makes a Bathroom Style Modern? Modern style can be mean different things to different people, but generally speaking, when we refer to modern design, some of the same concepts and strategies are often found: geometrical shapes, neutral or basic colors, little to no decorative flourishes, and natural materials. If you're remodeling a bathroom in a modern home, you'll be inspired by some of these examples from prominent designers. This bathroom by Stephani Buchman, via Houzz has all the hallmarks of a modern design: simple geometric shapes (dominated by squares and rectangles), the predominance of white with a little neutral gray, a natural stone backsplash, and little in the way of decoration. The fresh flowers definitely make the room here. Not only do they add a touch of color (which you can change according to your mood), but they also make the bathroom less sterile, and more homey and welcoming. Another feature of a lot of modern-style bathrooms is an open plan, usually involving transparent glass walls around showers. This is especially good in smaller spaces. This bathroom uses a "wet-room" style and distinctly modern elements: geometrical shapes in basic squares, a monochrome color scheme, and minimal decorative elements (again, a few flowers seem to do the trick). Not all bathrooms have to be cold and sterile to be modern. Take this example, a contemporary master bathroom by Rusal Construction, via Zillow: The space is warm, inviting, welcoming. We still have the focus on geometrical shapes (in this case, egg-like shapes via the sink and tub), a simple color scheme (warm neutrals), and minimal decorative elements. Wood and stone (or convincing look-alikes) are typical modern features. This one definitely has more decoration than most modern bathrooms, but the decorative items are simple, with basic shapes: empty frames, paddles, and candles. This bathroom, found on Homestratosphere may be the epitome of modern. A floating vanity makes the space look bigger, wall-sized windows make the bathroom seem like part of the landscape, and the transparent freestanding tub has almost no visual presence in the room. This bathroom definitely has "minimal footprint" in mind. Every element is chosen to occupy as little space as possible—both physically and aesthetically. The transparent tub definitely makes this space! This marble bathroom by Studio Isle uses a lot of modern decor staples, along with a touch of glam thanks to its golden hardware and its all-marble design. The rigid application of square and rectangular shapes is contrasted only by the curves of the faucet spouts. Note how the temperature control handles for the sink are on the side, rather than on the top next to the faucet. This is an interesting choice that brings more attention to the rectangular shapes that dominate this bathroom. Modern bathrooms don't always go with the white, gleaming look. Sometimes dark is also modern, as with this modern bathroom space by Bau-Fritz GmbH &Co. KG, via Houzz, dominated by a dark gray slate tile. The light wood furniture and white fixtures bring a needed touch of light, color, and organic feel. Notice the minimal hardware and how the shape of the sinks echoes the size and shape of the tiles. 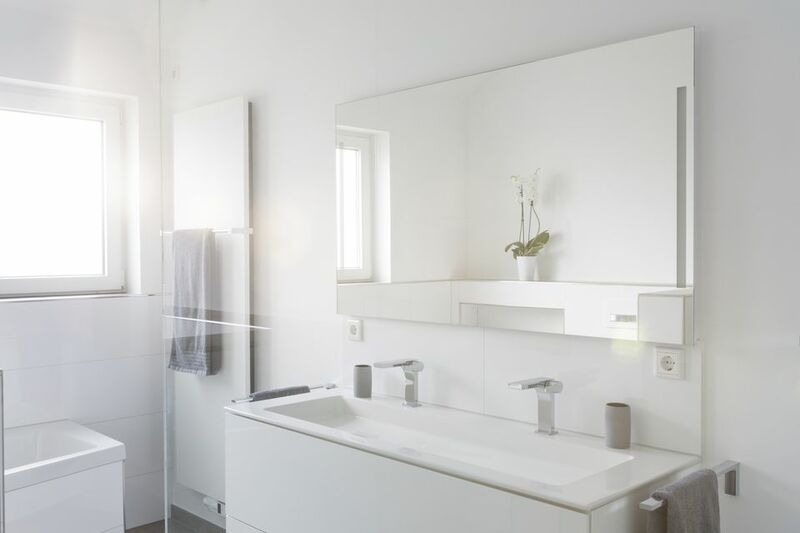 Minimalism is a major feature of modern decor—and this bathroom by Jose Campos is as minimal as it gets: all white, focused on function, and without any fluff. This bathroom is certainly stark but also rather serene. You can easily imagine freeing your mind from daily worries in a space that has nothing to distract you. Modern style also extends to what designers call "mid-century," a decorating style inspired by the sensibilities and building practices of the 50s and 60s. In this modern bathroom, found on Homestratosphere, it's the rounded corners of the vanity that gives the space its mid-century vibe. The dark wood paneling contrasting the neutral beige tile also contributes to this typically mid-century modern bathroom. 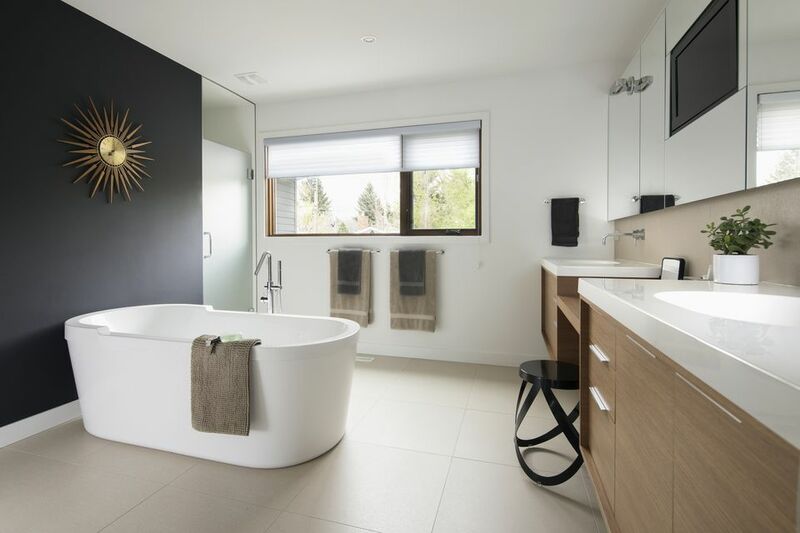 This modern bathroom by Pental Surfaces, via Zillow, features an interesting mix of styles, but it's definitely modern. Just have a look at the variety of geometric shapes, from the circular mirror to the cylindrical pedestal sink and triangular light fixtures. These are all contrasted by small, dark, rectangular tiles. The distressed wood of the floating shelf and single wooed chair adds a touch of organic material that makes all the difference here. Definitely on the masculine side, this bathroom is a cool, intriguing exploration of modern design features. The modern style is great for small spaces but can be even more striking when applied to larger areas. In this beautifully luxurious modern master bathroom by Lars Gitz Architects, you have a sofa, a double-sided fireplace and a bed of river rock for the tub. Of course, the predominance of white—along with the lack of decorative elements—makes this bathroom eminently modern. The tile adds some visual movement to the design while recalling the shape of the river rock. If you lack the space for both a tub and a shower, why not combine the two in the same area? This wet-room style bathroom, found via Houzz, uses its space effectively very effectively. Note the slight incline of the tile that helps water drain. Modern features include the all-over dark tile, the simple shapes of the tub and toilet, and the decorative touch via plants and flowers. For those who prefer more than one color, try combining black and white for a striking yet super-modern contrast. In this modern bathroom by John Wheatly, black and white define the space and the shapes for a harmonious minimalist effect. But the most interesting thing in this bathroom is the cool geometric mosaic: Are they cubes or hexagons? The tiles provide visual interest and movement. Remember: modern doesn't mean colorless! Modern bathrooms can accommodate color very well, especially if it's a single, bright shade. Yellow (as in this contemporary master bathroom) red, blue, or green—as long as it's a saturated hue and used as an accent, it will enhance your modern design. This small yet mighty modern bathroom by M House features a lot of the things we've seen so far: black and white styling, clean geometrical shapes, and organic decorative elements. The stool is a wonderful detail—its shape recalls the smooth lines of the tub. The flowers on the windowsill and the cowhide rug add softness and warmth in what would otherwise be a stark and minimal space.